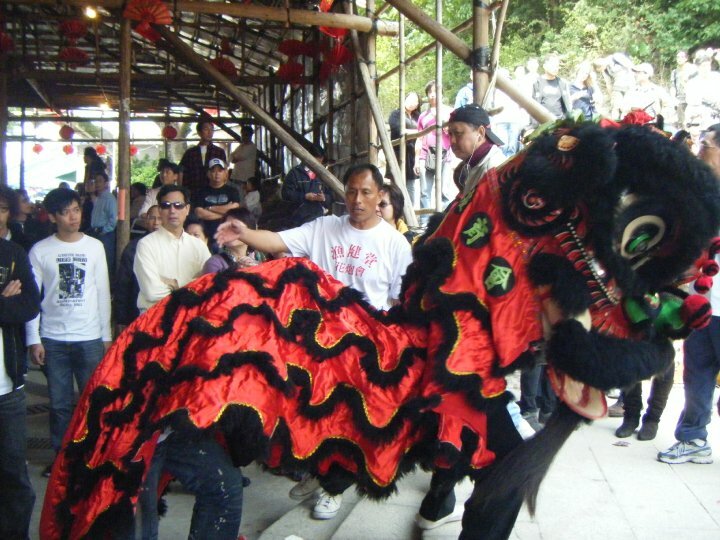 I thought Chinese dragons were as colorful as festivals got in Hong Kong, but I was wrong. Have you ever heard of flower cannons? If not, check out the Hung Shing Festival in Kau Sai in my latest post. Did I mention I discovered my new love for Xiao long bao here too? Yeah, that happens also. Saturday night, after a day spent studying, I went out with some of my friends to see the Hong Kong Flower Show in Victoria’s Park in Causeway Bay and then to dinner at a place called, Crystal Jade, famous for its Xiao long bao. The flower show was gorgeous; beautiful topiaries of basically any Disney character you could ever imagine; there was a horse drawn carriage, a prince and princess on a rotating flower pedestal, a pirate ship, giant animals shaped out of bushes, what looked like the entire cast of Finding Nemo, a replica of Cinderella’s Castle and the entire cast of the Seven Dwarves. Along with all this Disney motif, the various garden clubs around Hong Kong had put their best work on display too; African violets, orchids, and just beautiful flower arrangements in general. It was well worth the $7 HKD we paid to wander around in there. Dinner afterwards was great! Our friend Kevin (who grew up in China north of Beijing until his family moved to Canada) helped us choose what to order from Crystal Garden. We had to get Xiao long bao of course, which are little dumplings with pork and soup in them. What you are supposed to do is pick them up without breaking the dumpling skin letting the soup out, and eat them in one big bite so the meat, dumpling wrapper, and soup all melt together in your mouth. It was absolutely delicious and I highly recommend it (I ended up having the best Xiao long bao in Shanghai, but that was to come later). Along with those we ordered cold noodles in a peanut sauce, chicken with flat noodles, fat noodles with bok Choy and mushrooms, the sweetest, sauciest spare ribs that side of the world, and for dessert, glutinous rice in Chinese rice wine (sweet and much tastier than it sounds). The restaurant made all its own noodles in-house, which made them extra tasty, and Kevin went by what his grandpa would usually order at a similar type of restaurant in China. All I can say is, good choices Kevin’s grandpa, good choices. 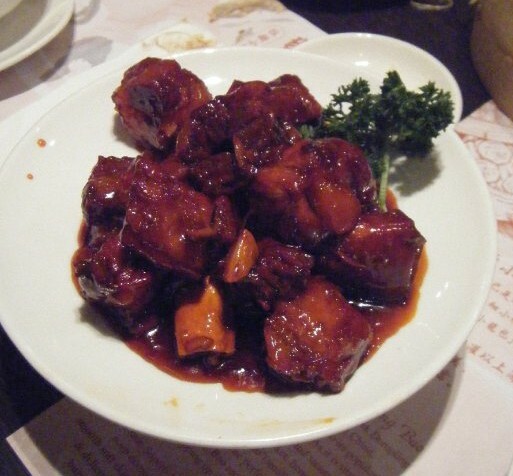 Some of the best spareribs I had ever had at Crystal Garden. Finally, the following day my “Marriage, Kinship, and Cross-cultural Perspectives” class had another mini-fieldtrip. That one was optional and involved going to Kau Sai, a little island a half hour’s boat ride away from HKUST and Sai Kung, for a yearly festival for their god, Hung Shing. My professor told us about it on Wednesday afternoon and by Thursday morning, I had convinced five friends to come along. We arrived at the HKUST pier at 8:30 in the morning on a Sunday (!) 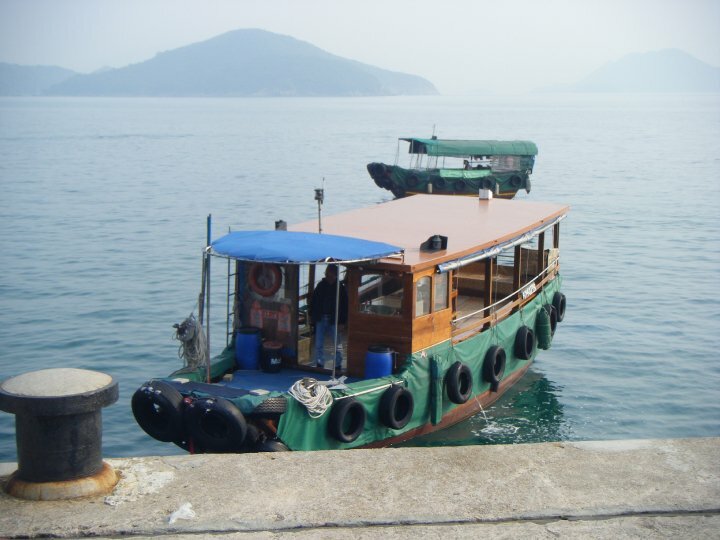 and hopped on the two junks that had been rented for our little excursion along with the offering of clothes and a whole roasted pig for Hung Shing. The size of each flower cannon was enormous! When we arrived at Kau Sai, the festival was already in full swing; there were colorful flags decorating all the boats in the harbor, people selling souvenirs, a make-shift theater erected for the Cantonese opera performance later that afternoon, and these enormous things called flower cannons standing all around and being hauled to and from the temple entrance. 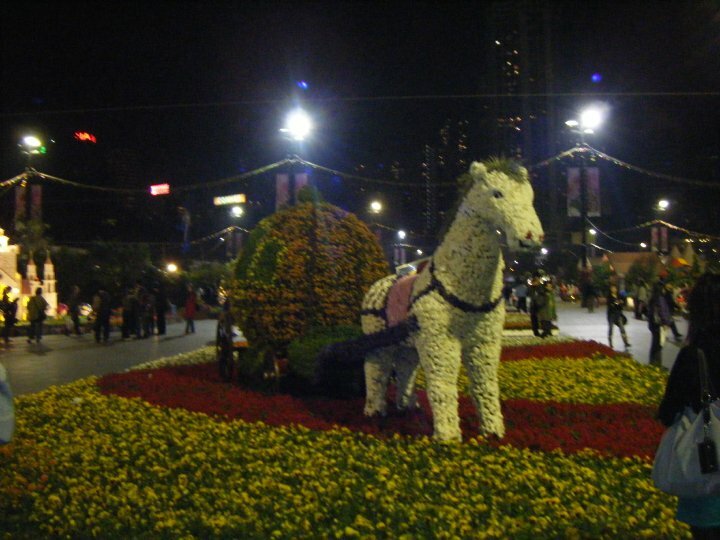 One of our translators explained that the flower cannons were raffled off each year to people and that if you won one year, you had to bring back a new one to the festival next year which cost about $4,000 HKD. 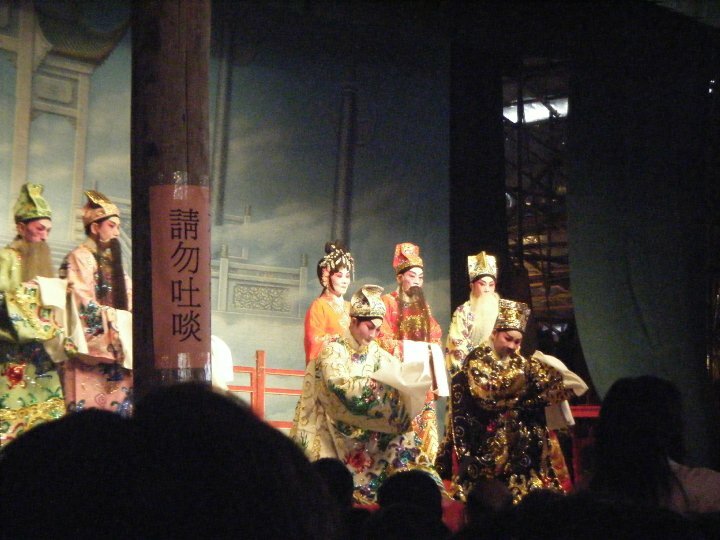 Part of the Cantonese Opera for Hung Shing’s festival. It just sounded like a lot of wailing and crying to me. They were set in front of the temple to “recharge” with good karma for another year of good luck to whoever was charmed enough to win the cannon that year. While we were wandering around later, we saw at least two different dances featuring Chinese dragons come rushing into the area where the opera would be performed, and witnessed the ritual sticking of our pig for Hung Shing, then the ritual chopping up of the ENTIRE pig for everyone to eat! I literally watched a guy with a hatchet methodically slice up every single piece of this pig (even the head) on the ground with only newspaper under it, and dole it out for all watching to eat. The skin was apparently the really prized part, but I was happier when I found some really good pieces of pork minus the skin, bone and fat. Just my Western tastes coming through I guess. After that interesting experience, we observed the beginning of a four-hour Cantonese opera (all of us left after about 30 minutes since we couldn’t understand what was going on anyway) and finally took another boat to the fishing port of Sai Kung. Three different Chinese dragons performed during the festival. 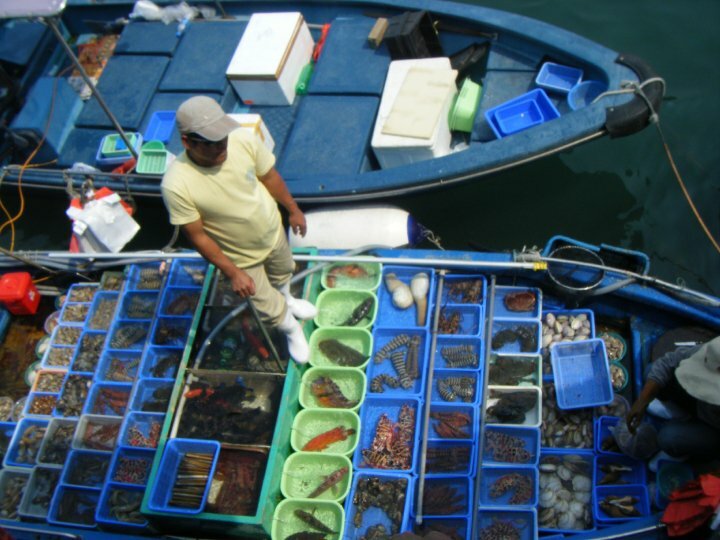 At Sai Kung, we saw fisherman selling live, fresh fish straight out of their boats to people calling down from the pier above. The person would select a fish by pointing, the fisherman would bargain about the price, then clean and gut the fish right there in the open, put it in a bag, and pass it in a net on the end of a pole up to the person who would take the fish and put money into the net for payment. Very entertaining to watch, and the best part was all the dogs I saw (I hadn’t seen many since arriving in Hong Kong, so it was a fun moment). I saw so many; Pomeranians, Chihuahuas, a Westie, poodles, Scotties – it was great! Finally, in the late afternoon, we were all hot, tired, and dirty and took a mini bus back to HKUST. It was certainly quite an experience, and a unique way to spend a Sunday afternoon. Well everyone, this was the last update I’d post for the next two weeks because starting the following afternoon, I’d be leaving Hong Kong (and my computer) until April 11th for SPRING BREAK IN MAINLAND CHINA!!! Beijing and Shanghai to be exact. I couldn’t even begin to imagine the tales and pictures I’d come back with (or the length of my next updates!) but be prepared for a novel! Since this is in retrospect though – you’ll get the whole story much faster. And here are a few teasers to whet your appetite: food poisoning, the Great Wall of China and Shanghai’s tallest tower all played a part in the adventure of a lifetime. Pick your dinner – it’s fresh! 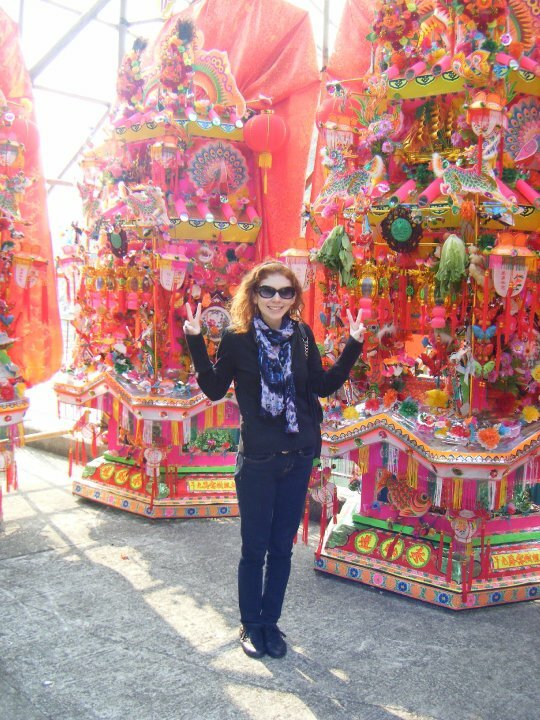 This entry was posted in Asia, Hong Kong and tagged Asia, Chinese Dragon, Dragon, Flower, HKUST, Hong Kong, Sai Kung, Travels, Xiao long bao on March 28, 2014 by Paige N..